2 Bedrooms, 2 bathrooms, Private Terrace with Hot Tub, Adult only, Free wi fi. Our Luxury 2 bedroom timber clad chalet/bungalow with hot tub on private terrace, newly built in 2017 this accommodation has a 4* Gold Award with VisitEngland. Main bedroom super king size bed which can be converted into twin beds, 2nd bedroom King size bed also can be converted into twin beds both bedrooms have wall mounted TV, en-suite shower rooms and have patio doors leading onto the private terrace with hot tub. Open plan living area with modern anthracite gloss fitted kitchen, with large fridge/freezer and integrated dish washer. Dining table and 4 chairs, comfy sofas and 40 inch 4K Ultra HD Smart TV and DVD player with full central heating throughout and free wi fi to complete the feeling of comfort and luxury. The Hot Tub is an optional extra for £50.00 per stay payable locally on arrival, please let me know if you want to use it and I will ensure that it is made ready for your arrival. The chalets are situated on a small holiday park on the outskirts of Blyton village in Lincolnshire, with a friendly village pub/restaurant, a chinese take-away and a village shop all within walking distance. The holiday park offers a breakfast cafe and has 4 fishing ponds should you decide to bring your fishing rods with you. The park has an adult only no pets policy so is an ideal spot to relax and unwind. Parking is directly alongside the chalet/bungalow and is sufficient for 2 cars, with extra parking elsewhere on the park. The historic city of Lincoln is a short drive away and the market town of Gainsborough is just 4 miles away. Although everything you would need is within walking distance a car would be advised to get the most out of your stay with us. Blyton Ponds has been welcoming holiday makers since 2000, with many of our guests coming back year after year. We offer a friendly holiday experience in an adult only environment allowing you to enjoy complete relaxation and tranquility. We love what we do and we hope you love it too. Our newly built in 2017 chalet/bungalows offer true luxury as is confirmed by our VisitEngland 4* Gold Award for self catering accommodation. 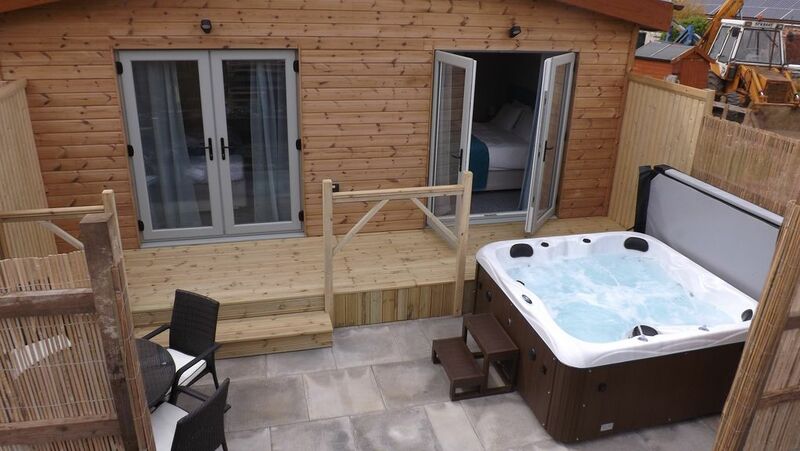 We think you'll love the hot tubs whatever the weather. Blyton village offers a friendly family run village pub offering true home cooked food for reasonable prices and is within easy walking distance so you can leave the car behind and enjoy a glass or two of something cold. There is also an excellent Chinese take-away, and a village shop, so once you're here you can park the car and leave it there for the duration of your stay should you wish. Excellent fishing on site in our 4 ponds is available for a small extra charge for the anglers among you, and each of our 12 accommodation units has a dedicated fishing shed alongside with a bait fridge so there is somewhere secure to store your tackle and bait or even your bicycle if cycling is your thing. Adult only site offering 12 units of accommodation in total. The chalet/bungalows of which there are 2 have been newly built in 2017 and offer a peaceful haven away from the stresses and strains of everyday life, relax in the hot tub with a glass of something cold and listen to the sounds of the countryside around you. So come to visit us and leave truly relaxed and ready to face the world again. Private terrace with hot tub accessed via patio doors from each of the two bedrooms. Optional Hot tub available to hire for a small charge of £50.00 on the private terrace. There are 4 ponds on site and Fishing is available on site for a small extra charge. A beautiful chalet, so lovely to be in the countryside. Definitely going to book again. We booked Blyton Ponds two days before leaving, due to another provider letting us down. We discovered the beautiful chalet, it was an easy and hassle free to book it, didn’t have to wait for approval. Angela, the lady that owns the properties. She is so accommodating, I contacted her about a number of questions. She was quick at reply and gave me the necessary information. Once arrived at Blyton Ponds, it was easy to find the chalet as all the properties have names. Angela meets us at the property ans showed us around. The property may look small on the outside, but it certainly big in the inside. It is wonderful set up and everything is just beautiful. There is a welcome pack which has all the information about fishing in the ponds to stuff around the area. The hot tube is absolutely amazing, I’m certainly missing it now. Extra bonus to our wonderful holiday. Would highly recommend for people that want a getaway with little disturbances and also for people that like/love fishing definitely book here. There is 4 Ponds which you can fish in! Thank you so much for taking the time to review your stay with us. It was a pleasure to have you and your party as our guests. It's always lovely to know that you have enjoyed your time here and hopefully we'll see you back again. All the very best Angela Forrest. Warm welcome. Peaceful chilled out stay. Could not fault. We arrived to a warm welcome. The accomodation was very clean with good facilities, especially the hot tub. We ate twice in the Black Horse (5 mins walk) and the food was excellent. We also had a takeaway from the Chinese (across the road from the Black Horse) which was also good. I wouldn't hesitate to recommend this to anybody looking for a relaxing peaceful getaway. Thank you for taking the time to review your stay with us. It's always a pleasure to hear that our guests have enjoyed their stay with us and the facilities that we offer as well as the facilities available in the local area are appreciated. We look forward to welcoming you back some time in the future. Kind regards, Angela Forrest. nice relaxing stay,no problems, accommodation was good & clean. Thank you for taking the time to review your stay with us. We're pleased to hear that you enjoyed your break, and hope to meet you all again if your looking to come back to this area. Kind regards, Angela Forrest. If you want to get away from all the hassle that every day life brings this is just the place to go! Everything is very well looked after and its absolutely spotless! Angela is really lovely and we received a very warm welcome while been showing around. Everything you need is supplied, from kitchen roll to bathrobes. We hopped into the hot tub once due to the rainy weather over Easter this year and found it highly relaxing! The pub down the road served a nice pub grub and the staff was as well super welcoming and friendly despite us booking a table on short notice for Easter Sunday. Pop into Linclon for a day and you won’t be disappointed by the lovely town. Thank you for your lovely comments on your stay with us, we are pleased that you enjoyed your break. We do try to make our guests welcome and its always good to know that we have made your stay enjoyable. Hope to see you again in the future. Kind regards, Angela. Excellent base for exploring local attractions. Thank you for taking the time to review our accommodation. We are pleased that you enjoyed your stay with us and look forward to seeing you again sometime in the future. Kind regards, Angela. Bath towels, slippers and towel dressing gowns. Beds very comfy. The hot tub to die for!!! Blyton Ponds has 4 well stocked fishing ponds providing guests with first class fishing for a small extra charge. In the market town of Gainsborough delve around the Old Hall, a well restored Tudor Manor house then take tea in the cafe/restaurant with traditional cakes etc. Keep an eye out for events at Trinity Arts in Gainsborough, local theatre, live streaming and cinema releases. Historic city of Lincoln 30 minutes drive offers Castle walks, Victorian prison, & Lincolnshire life museum, with shops and restaurants in abundance.